In November 2012, when left the last research of The Economist on competitiveness in Brazil, the position of Paraiba was featured in the local newspaper. The state had 56.3 points, below the national average, but third in the ranking of the Northeast. 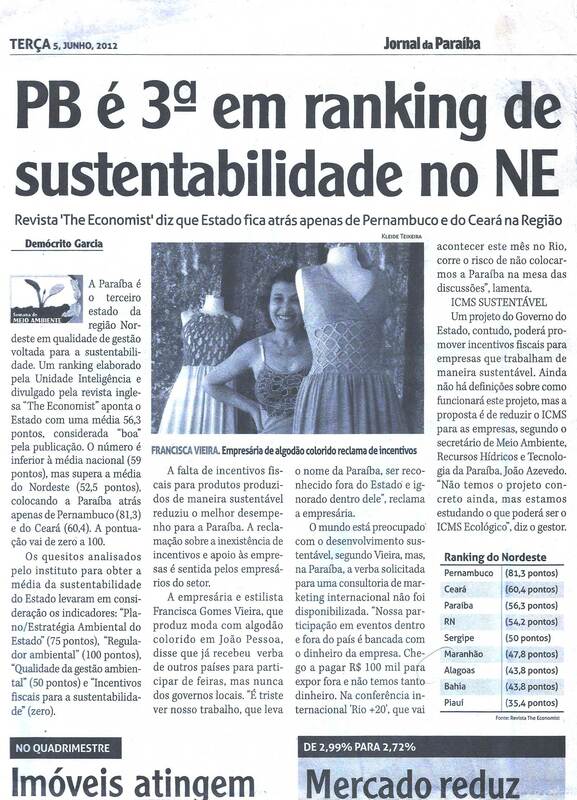 In an interview with Jornal da Paraíba, the designer and businesswoman Francisca Vieira revealed that the lack of tax incentives for the sustainable enterprises such as the Natural Cotton Color group – NCC Ecobrands, where exerts leadership, prejudice the assessment. The group, which takes the local production of Fashion and Decoration with colored organic cotton for national and international trade shows, never hadthe support of local government. “It’s sad to see our work, which takes thename of Paraíba, be recognized outside the state and ignored within it,” saidto newspaper.